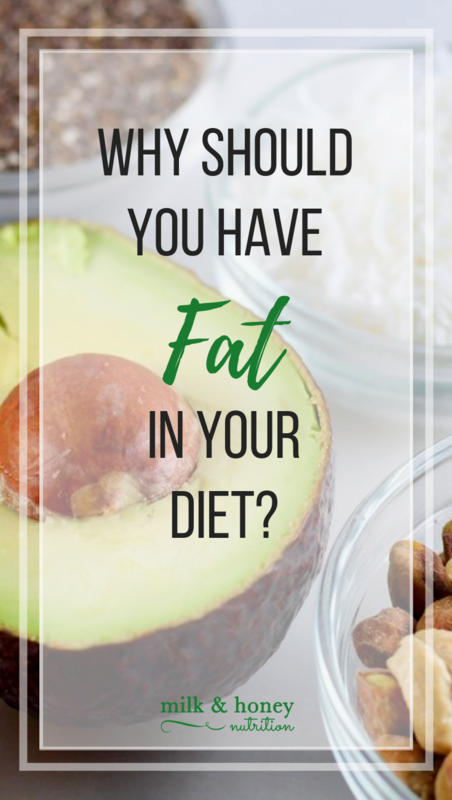 This post for “Why should you have fat in your diet? : 5 reasons to not fear fat” was sponsored by Bobo’s Baked Goods. But rest assured, all thoughts and ideas are my own. “Fat” is an often loaded and fear-inducing word in today’s culture. So, why should you have fat in your diet? Before we can answer that question, I think we need a brief overview of what fat is and why it has been feared by so many for so long. For decades it was demonized and cut out of too many foods to count. In spite of the low fat/fat free craze that dominated the 80’s, 90’s, and early 2000’s, the rates of diabetes, heart disease, and other chronic conditions continued to rise. There’s many reasons for this, one of which is the fact that when food manufacturers cut out fat, they made up for the lack of flavor by adding in more sugar and preservatives. But fortunately, about a decade ago researchers and dietitians alike started to come around to the idea that fat is not the enemy, and we’ve been working hard to change the opinion of the American public too. The 2015-2020 Dietary Guidelines for Americans even dropped their recommendation for a “low fat” diet and instead recommended a diet rich in “healthy” unsaturated fats. As a type 1 diabetic, I received countless hours of nutrition counseling and diabetes education from the time I was diagnosed at 5 years old until I was a newly licensed dietitian at the ripe age of 24 and seeing diabetes patients of my own. I had been taught my whole life that I needed to eat a low fat diet to be healthy and control my diabetes. I was even teaching this to patients in my first job as a diabetes educator. About that same time though, we started to see more and more data and science coming out to support the role of fat in the diet and more calls for fat to not be restricted unnecessarily. And as any good dietitian does, I formed my own opinion based on science and my training to interpret science. 1) Why should you have fat in your diet? : It tastes good! Ok, so this one is a no-brainer. But hear me out. If you’ve read anything I’ve posted here on the blog or over on social media, you know I LOVE food, and my goal in everything I do is to create joyful experiences around food and help you recreate those experiences in your own home. (Read more about that here.) And in order to do that, food has to taste good! It’s a fact: food that doesn’t taste good is incapable of bringing you joy. And pretty much any “fat free” food tastes like melted plastic in a hot Houston summer. (I’m not talking about naturally fat free foods like fruits, veggies, etc… I mean the foods altered by humans to be fat free like cheese, cookies, crackers, etc.) Whether it’s adding avocado to a piece of toast or some nut butter in your favorite breakfast bar, fat just adds to the eating experience and makes things taste better. 2) Why should you have fat in your diet? : It helps you absorb nutrients. There are two different types of vitamins: water-soluble and fat-soluble. Water soluble vitamins (B vitamins, and vitamin C) are absorbed easily and any excess amounts are excreted by the body. Fat-soluble vitamins (vitamins A, D, E and K) need fat to be absorbed into the blood stream, and any excess amounts are stored in the body so your body can pull from your supplies in the event your diet starts to lack any of them. 3) Why should you have fat in your diet? : It keeps you full. I find it funny that people looking to lose weight often try to avoid fat at all costs simply because it has more calories than the other macronutrients (or at least that was the trend for the last 30 years). It’s funny because, fat is probably the single most effective appetite and hunger regulator there is. No pills, no gimmicks. Just a normal nutrient that occurs in food. Fat takes the longest to leave your stomach… meaning when you eat a meal with carbs, protein, and fat, the carbs are digested quickest, then protein, then fat. So, when you eat more fat with a meal, it keeps you fuller (and satisfied) longer than a low fat or fat free meal. When more fat is present, the food you’ve eaten takes longer to leave your stomach. 4) Why should you have fat in your diet? : It can help stabilize post-meal blood sugar levels. This is something I preach over and over again over on instagram. Whether it’s first thing in the morning or mid-afternoon, fat can help sustain and delay a blood sugar response. I like to compare it to a roller coaster. With a high amount of carbohydrate in isolation, your blood sugar on a graph would resemble a really steep climb and then an equally steep drop back down. (That drop back down does NOT feel good… trust me.) But when you add fat (and protein) to the same carbohydrate content, you have a much more gradual climb and then decline. Add your own nut butter to a higher carbohydrate oatmeal bar (like the original Bobo's bars) or try a pre-made version with nut butter added in. 5) Why should you have fat in your diet? : It may help with inflammation. We’ve had data for over a decade now that omega-3 supplementation (taking it in pill form essentially) can help with the inflammation associated with many autoimmune conditions. It seems that when broken down in the body, omega-3s get converted into compounds that are highly effective at fighting inflammation and reducing pain for some people. Some great sources of omega 3s include salmon, walnuts, and almonds. Want to add some more fat into your morning? Try any of the following options with Bobo's Baked Goods! And use the code MILKNHONEY20 on their website for 20% off your order.